An easy walk through a tranquil valley, see ochre beds, authentic tools of the furtrade and cross a suspension bridge! This fun, mini course is perfect for any group wanting to learn more about the outdoors and have some fun in the mountains. Throughout the mini course you will learn basic skills required for winter survival while snowshoeing to the tranquil setting of Vista Lake. Along the way evaluate real stories of winter survival, learn the basic skills to stay alive in the wilderness and test your knowledge with a team activity. Finally, you will earn a Souvenir Certificate upon completion of the mini course. 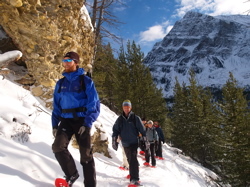 Trek through the Canadian Rockies on a snowshoe tour offered by Banff Travel. Admire the beautiful winter scenery while learning about the fur trading industry, which impacted the way of life in Western Canada. 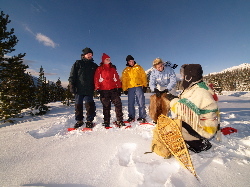 Each tour is led by a certified and informative guide who will relate stories about Banff’s indigenous people and their encounters with the fur traders and explorers. Guests will see up close some of the original handcrafts used by early Canadian Rockies settlers in order to survive in the mountains. 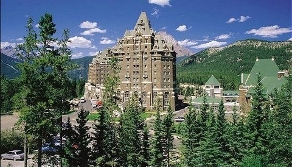 The tour includes hotel pickup and drop off as well as the necessary equipment such as snowshoes and hiking poles. Enjoy a maple taffy treat and a hot chocolate at the completion of the tour.